Enjoy the untouched beauty of the Caribbean Coast! Costa Rica Caribbean hotels are excellent for a unique cultural experience. Costa Rica’s Caribbean is famous for its open-air bars and discos which come alive on the weekends, exotic restaurants, small bungalow beach resorts! Distinct from all other areas of Costa Rica, its an area rich with Afro-Caribbean flavors. Caribbean beach resorts are a great option for travelers who wish to stay away from the traditional tourist path in Costa Rica. The Caribbean coast‘s less developed but offers a unique experience for all who visit! This region is a diverse atmosphere of Afro-Caribbean and Latin culture. As a result, this region has a unique laid-back atmosphere and natural beauty, making it a great choice for a vacation! Explore Cahuita in the Caribbean! This area has excellent accommodation options. Another attraction are the coral reefs off Cahuita Point. This reef is considered one of the best snorkeling destinations in Costa Rica. 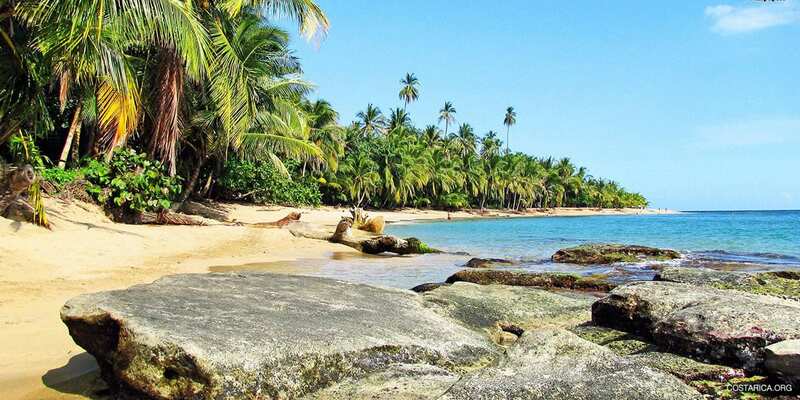 There is also Puerto Viejo de Talamanca, one of the most popular beaches towns along Costa Rica’s Caribbean coastline. If you are looking for a hotel in Puerto Viejo there are a number of options available! One of which includes the beautiful Azania Bungalows. For those who are looking for luxury, no hotel on Costa Rica’s Caribbean coast rivals the newly opened Le Cameleon. Also Manzanillo Beach. Here you can spot sloths, monkeys, and toucans! This rural road also contains many hidden beaches and resorts. In addition, there are resorts and beach bungalows along the road that host yoga retreats, and other activities! You can find some of the coziest Caribbean hotels in Costa Rica here! More popular destinations on the Caribbean coast include Tortuguero, Puerto Viejo, Cahuita, and Manzanillo further south. These areas also offer the Caribbean relaxed “rasta” vibe and uninhabited rainforests that meet the beautiful oceans. Towns offer the tourists a chance to mingle with the locals. Although the Costa Rica Caribbean Beach Resorts may not be as prolific as on the Pacific coast, there are some great ones to choose from. The best beach resorts dotting Costa Rica’s Southern Caribbean coastline are definitely in Cahuita, Puerto Viejo, Cocles, Punta Uva and Manzanillo. They don’t always have pools and they are not that big. Although the resorts on the Northern half of the coastline usually have pools, they are more inclined to riparian adventures and marine turtle nesting, so they will remain untouched for now. Along this part of the country, visitors will find themselves immersed in an Afro Caribbean culture that serves delicious coconut rice, loves to ride bikes, lives in nature, and are extremely friendly and patient towards theirs guests. First, this hotel is the best luxury hotel that Tortuguero has to offer. Surrounded by beautiful Tortuguero canals and a wildlife sanctuary, and the hotel itself has pretty, clean and open rooms with wooden floors and modern decorations. Enjoy the comforts Hotel Mantus offers after a day exploring the Tortuguero National Park. There is even a great restaurant on site, which offers Afro-Caribbean fusion cuisine! Situated just outside Puerto Viejo, Le Caméléon is one of the most intricate and beautiful hotels on the Caribbean coast of Costa Rica. The hotel is also within a stones throw from Playa Cocles. The hotel is so unique and even changes color using special lights; and since it is painted white, the color of the decor is always changing. This hotel is also situated within Manzanillo Wildlife Refuge, that offers stunning beaches as well as a dense rainforest. Enjoy a private bungalow in the mist of paradise. Located in Cahuita, this luxurious hotel has a stunning, huge pool and a plethora of exotic plants and wildlife on it’s property. Close to the hotel is Cahuita National Park, as well as stunning Caribbean beaches dotted throughout the area. The bathrooms are spacious and use solar heated water, which contributes to conserving the natural beauty of the area. For those looking for a hotel directly on the beach, where you can walk out of your room on to the lush sand, then Villas del Caribe in Puerto Viejo the place for you. Every room has an ocean view with a balcony or terrace and a king size bed, private bathroom, and hot water. This beachfront hotel in Cahuita surrounded by gardens. The lodge offers a typical laid back Caribbean atmosphere and is a perfect place to relax. You can even observe different colorful species of frogs in the gardens of the lodge. Or guests workout can do so in the small outdoor gym. Located on Cocles Beach, Azania Bungalows was awarded with the Costa Rican Government Blue Flag Award for clean beaches. Enjoy the free-form pool and jacuzzi as you become mesmerized by the tropical gardens. Cariblue Bungalows a beautiful hotel made up of a selection of bungalows and a 7-person villa just steps from the gorgeous Cocles Beach. It has free wifi, a game room with a tv, billiards, ping pong, various board games, and a big pool area. Mawamba Lodge located between the Tortuguero Canals and the Caribbean ocean on a sand bar. One of the most beautiful hotels in Tortuguero, the resort boasts views of the Tortuguero lagoon and a variety of exotic wildlife.